Heavy Duty Stair lifts and Bariatric Stair lifts are all made with a unique weight capacity of up to 29 stones. If you are experiencing difficulty using your stairs and considering a heavy duty stair lift then an individual assessment with an Occupational Therapist is strongly recommended as your safety on your stairs is essential. There may be individual factors which determines which style of stair lift suits you needs best. It is advisable that the stair lift covers the whole staircase. Some people will attempt to save costs by installing a straight stair lift on a curved staircase and attempt to manage the first or last few steps. However, if your condition deteriorates, you may no longer be able to manage this. The stair lifts also have different controls depending on the dexterity of the person using the controls. The Occupational Therapist would discuss all the options available when the home assessment is carried out . If you have a door or passage way at the top or the bottom of the stairs which may be blocked by the rail of the stair lift, there are options designed to resolve this problem. Our stairlift for straight staircases provides a premium stairlift for those who want the ultimate in options, luxury and elegance. With a choice of fabric colours and compact dimensions, our stairlifts are an elegant and attractive addition to any home. Our straight stairlifts are simple to install and therefore are installed very quickly. Fitted directly onto a staircase cleanly and discreetly, the stairlift glides effortlessly along an aluminium track. Designed to be a feature of the home, rather than just a mobility product, your can choose between seven upholstery options to determine the best fit. Curved armrests fold inwards to make you feel more secure during travel. The seat height is adjustable to five different positions when a powered swivel is used, which means that our straight stairlifts can be adjusted to suit a variety of users. Our straight Stairlifts fold neatly for storage, using its linked seat to footrest mechanism, removing the need to bend and manually fold the stairlift. A powered swivel can be added to our stairlifts to make getting on and off even easier. Unlike straight up and down stairlifts, our curved stairlifts are designed to travel up and around cornered staircases. The versatility of a curved design allows for easy installation anywhere, from a staircase with a single bend to spiral staircases. As such, you can now move around your beautiful home with style and convenience as our accessible stairlifts are installed with your peace of mind at the highest of regard. Our single rail stairlift is the market leader when it comes to curved stairlifts and is the smartest lift of its type. Ours is the only stairlift on the market which is capable of swivelling during the ride both up and down the stairs. This unique and patented feature makes the our curved stairlifts stairlift capable of fitting most staircases, straight, around corners or even spiral. This compact curved stairlift looks simple on the outside but the technology on the inside is extremely ingenious. The angle of the staircase can vary from -70° up to 70°. 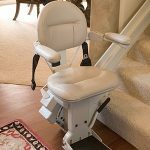 By using its patented power swivel system, the Flow curved stairlift can tackle staircases as narrow as 61cm (24 inches) wide, swivelling the footrest as it goes – the rail also sits closely to the stairs, making Flow the most adaptable stairlift in the world – no other stairlift can boast this. Our curved stairlifts have a seat which is ergonomically shaped to the user providing for a more enjoyable ride. Our curved stairlifts are designed to be a feature of the home, rather than just a mobility product; we offer a choice of three fabric colours, four vinyl, six leather and three comfort leather to determine the best fit. Optional curved armrests fold inwards to make the user feel more secure during travel. Our stairlifts fold neatly for storage, using its linked seat to footrest mechanism, removing the need to bend and manually fold the stairlift. Our Heavy Duty Stairlifts provide a beautiful and efficient means of traversing the different levels of your home efficiently and safely while our Elite range offer an innovative design to rival many stairlift makes and models. 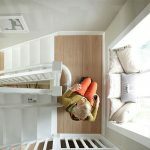 All of our heavy duty stairlifts are designed to be unobtrusive to your home, blending effortlessly into your home decor with such ease, you’ll barely notice they’re there. Our Heavy Duty Stairlifts and Bariatric Stairlifts are all made with a unique weight capacity of up to 29 stones and have all been carefully designed with your safety and comfort in mind. The Care Team heavy duty Stairlift range is available for both straight and curved stairways, so no matter the specifications of your home, we’re sure we can help you find a stairlift to suit your every need. Engineered by Bruno Independent Living Aids (the market leader in high-quality stairlifts in the US), our range of heavy duty stairlifts represent more than a decade of careful research , patience and a lot of love. Each stairlift has a stunning honeycomb rail design for improved stability while visually coded diagnostics enable the unit’s operational status to be seen at all times. Combining innovative design with unparalleled performance, durability and safety, The Care Team Stairlift Elite bariatric stairlift range is capable of surpassing your expectations in every possible way. Our range of Heavy Duty and Bariatic Stairlifts can be incorporated into any home in a subtle and stylish manner. Their efficient and stunning designs means that there’s something for everybody in our heavy duty and Bartiatic Stairlift range. We ensure all of our stairlifts are fitted with the upmost care and precision to your home. We ensure that no damage or scuffing occurs during installation and the appealing designs of our stairlifts ensure you’re able to enjoy the comfort and security of your stairlift without needing to compromise the aesthetical appearance of your home decor.